Billy Beane doesn't have a lot of money, but he has a lot of chuzpah. Moneyball, based on true events and the book "Moneyball: The Art of Winning an Unfair Game", dramatically details the Oakland Athletics 2002 season lead by their general manager Billy Beane (Brad Pitt). After the A's lost the 2001 American League Division Series to the New York Yankees, Beane concludes the game of baseball is fundamentally unfair. The Yankees and the Boston Red Sox have the highest spending budgets in baseball and pilfered their best players, Jason Giambi and Johnny Damon respectively, at the end of the season. The A's can't compete with their much smaller budget. 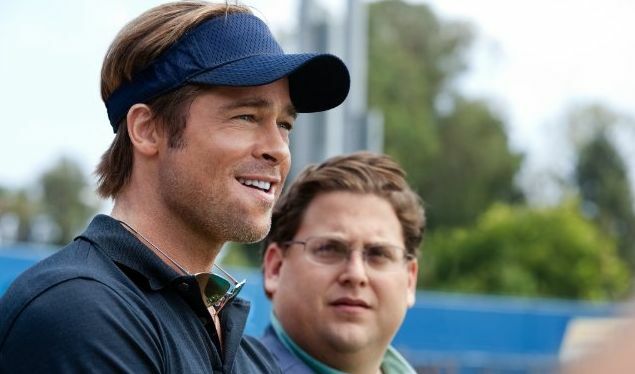 Moneyball is a sharp, entertaining baseball movie carried by Pitt's money lead performance. There are moments throughout Moneyball, especially in the propulsive manner the film presents discussions of baseball statistics, that echo the feel of The Social Network. No wonder - the screenplay by Steven Zallian was re-written by The Social Network's Aaron Sorkin. The final moments where Beane listens to his daughter singing Lenka's "The Show" are oddly devastating. Billy Beane set out to change the game of baseball, but Moneyball doesn't touch on what long term effects his system had on the game, noting only that the Boston Red Sox won the 2004 World Series using Moneyball strategies. Moneyball does argue persuasively to both fans and non-fans that "it's tough to not be romantic about baseball." And I have to say, I understand the "MoneyBART" episode of The Simpsons a lot better now.